After looking at her palm i wonder why she is famous???? She can emotionally handle being in the spot light and in front of the camera. She has a prominent diagonal Girdle of Venus and what I call Star Trek lines. She enjoys thrills and excitement and is passionate. nirupam221987 wrote: After looking at her palm i wonder why she is famous???? Maybe one should not try to understand her fame from just her hand lines. Also, one should be aware that in the world of acting people often attract attention with both their body & personality. I think it is interesting to study her rather unusual hand shape is interesting to study in this perspective. Regarding her personality, she has an unusual personality that has been in the spotlight literally from the early days of her life because she is the daughter of the famous actor John Voight & actress/producer Marcheline Betrand. In her early teenage years she became involved in acting & modeling work, but she felt isolated (partly due to her skinny body) and developed selfmutulating behavior and became a heroin adict. And there are stories that she is an anorexic. Later in her career she attracted even more attention by... let's say: re-building her body. Patti wrote: She can emotionally handle being in the spot light and in front of the camera. She has a prominent diagonal Girdle of Venus and what I call Star Trek lines. She enjoys thrills and excitement and is passionate. Also her fate line seems to be either missing or too faint. She has forked head line on both hand will upload left pic soon..
Bdw go through her wiki page there are more interesting things also.. I've marked her star trek markings here for you. So star trek line is same as via lascivia rt?? or its some variation of it.?? What is significance of it on her hand.??? The via lascivia has been 'guessed' regarding location and indications so much that I rarely use that term. When I do it's regarding a crescent shaped crease that curves over the wrist from thenar to hypothenar. 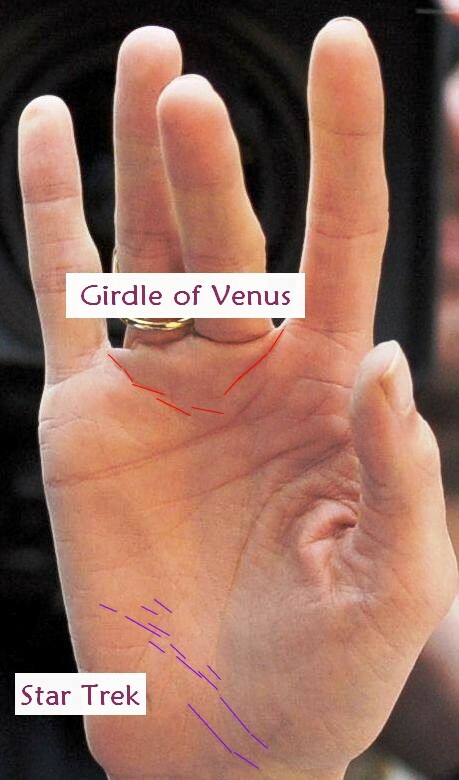 I see the bottom of the palm as relating to urges and drives. Rising creases from there relate to these impulses. The arcing crease (multiple creases) that appear to rise upward (not aiming downwards or coming in from the percussion) in my opinion relate to these primal urges and love of the sensations that go with being thrilled. The angled Girdle of Venus adds the enjoyment of intense sensual pleasure or strong passion. You can compare the energy to riding a roller coaster ride. Some people get thrills and pleasure and want to get back on, and other people find the ride a horrible experience and vow never to do it again. Being a celebrity can involve handling the thrills of fame, fortune and lime light. Not everyone is capable of living that kind of lifestyle. I agree with your interpretation about thrill seeking. The mount of Moon, percussion like drawn with a ruler or even bending a little bit inside, the low mount of Venus and lowness of the mounts all in all is showing that she is more looking for and wishing for sensations than having really a strong vital and body orientated pasion. It's shurely a good escape strategy to be always on the plane to get off this not easy to satisfy contradiction. RemarcableThe lowest edge of the Moon I call the mount of Uranus. Thanks for the additional insights about the "looking and wishing" for sensations and the features in that regards - I'll watch for these when I'm doing readings. We've talked in the past about how you have placed Pluto up higher (under Mercury) and Uranus below (under Moon) and I do keep that in mind. Not to forget she was born into fame through her father. Jon Voight. Began acting with him when she was a child. Yes. but at-least some signs..
She has common signs on actors and singers, long pinky, long thumb, (basically long fingers) the angles on the thumb. (Fate) Lines rising from the mount of moon are also very common on actors. The ring finger often longer (than index) on male actors, the index longer (than ring) on females. I know many Pisces females and they do like power and fame. Only one I know doesn't and she actually suffers from severe depression, (maybe because her power and fame are not met). mention: Jupiter in Pisces if using Vedic astrology. 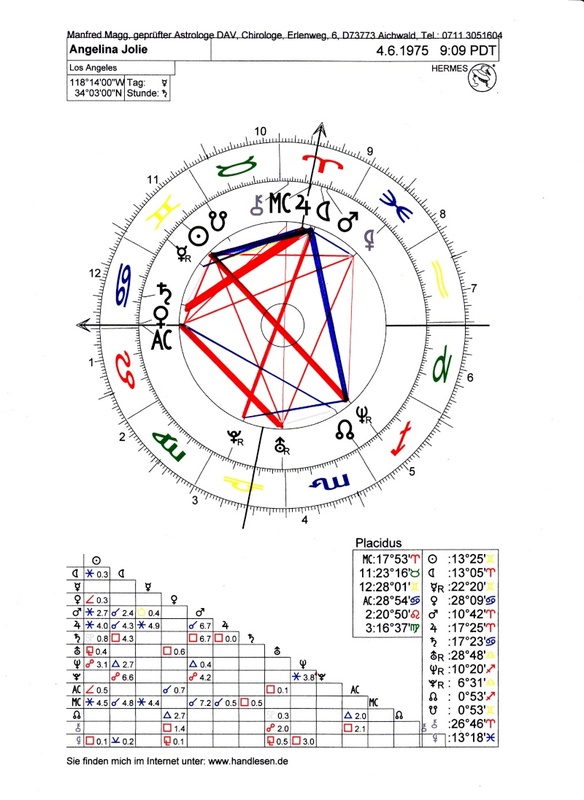 Down the Western astrology chart. Even the same in both systems: Jupiter / Moon on the dominant place in conjunction with the MC,what means popularity that is mentioned. - Neptun opp. Sun (an absent father). Additional point is that she is cyanosed and heart patient potrayed by blue veins and islanded heart line under sun mount.